HONEYBEES are sensitive creatures. From time to time a hive simply gives up the ghost and vanishes. 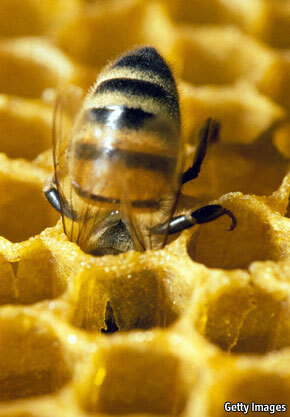 Colony collapse disorder, as this phenomenon is known, has been getting worse since 2006. Some beekeepers worry that it may make their trade impossible, and could even have an effect on agriculture—since many crops rely on bees to pollinate them. Climate change, habitat destruction, pesticides and disease have all been suggested as possible causes. Nothing, though, has been proved. But the latest idea, reported in Naturwissenschaften by Jeff Pettis of the Bee Research Laboratory in Beltsville, Maryland, suggests that this may be because more than one factor is involved. Dr Pettis and his colleagues knew from previous reports that exposure to a pesticide called imidacloprid has a bad effect on honeybees' ability to learn things and wondered whether it might be causing other, less noticeable, damage. Since one thing common to colonies that go on to collapse seems to be a greater variety and higher load of parasites and pathogens than other colonies, they wondered in particular whether it might be weakening the insects' immune systems, and thus allowing infections to spread through a hive. To find out, they gave 20 hives protein food (a substitute for pollen, which is fed to developing larvae) that had been spiked with imidacloprid. In ten cases the dose was five parts per billion (ppb); in the other ten it was 20 ppb. Previous experiments have shown that neither dose perceptibly harms bees. A further ten hives were given unspiked food as a control. Then, when the young bees emerged a few weeks later, Dr Pettis collected them and fed them with spores of a fungal parasite called Nosema. Twelve days later, he killed them and estimated the extent of their infestation. Both of the groups that had been exposed to imidacloprid harboured an average of 700,000 parasite spores in each bee. Bees from the control colonies, by contrast, harboured fewer than 200,000 spores in their bodies. The insecticide, in other words, was exposing bees to infestation, and thus to a much greater chance of dying prematurely. Whether this is actually the reason for colonies collapsing remains to be determined. But it is a plausible hypothesis, and is likely to get beekeepers buzzing with interest.